The St. Andrews Minors Club was officially formed on 5 December 1964. It was a club run by The New Picture House, and met every Saturday morning at 10:30 a.m. The aims of the club were set out in local newspaper reports. 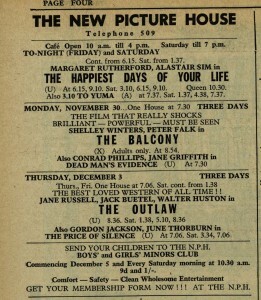 ‘The Minors Club has special showings of children’s films on Saturday forenoons’, The Citizen reported, ‘and provides a meeting place for children while parents are doing the weekend shopping’ (The Citizen, 17 December 1966). An earlier report further outlined the apparent pedagogical value of the club, stating that ‘In addition to film shows, talk are to be given on subjects such as road safety’ (The Citizen, 5 December 1964). This club was by no means unique to the town. Many major theater chains, such as ABC and Odeon Cinemas, had their own syndicated minors clubs that promised a morning of morally sound entertainment for children, while also offering parents some free weekend time to themselves. This can be seen in this ABC Minor’s Club commercial from 1963. These commercial minors clubs were predominantly focused on providing entertainment. Though minors clubs were a national phenomenon, the St. Andrews Minors Club appears to have catered for local concerns, most notably by initiating community outreach with a local hospital. Throughout 1966, newspaper reports and advertisements emphasised the club’s work with the senior citizens of the Gibson Hospital. This sense of instilling values into the club’s members can be traced back to the Children’s Entertainment Movement, which was spearheaded by Mary Field and J. Arthur Rank in the 1940s. J. Arthur Rank and his organisation owned the Odeon Cinema chain and, recognising the growing trend of children’s film clubs, set up Children’s Entertainment Film (CEF). With Mary Field as producer, CEF sought to produce films that espoused good morals and values to this expectant Saturday morning audience. In 1950 the CEF closed, but the government-backed Children’s Film Foundation soon took its place. 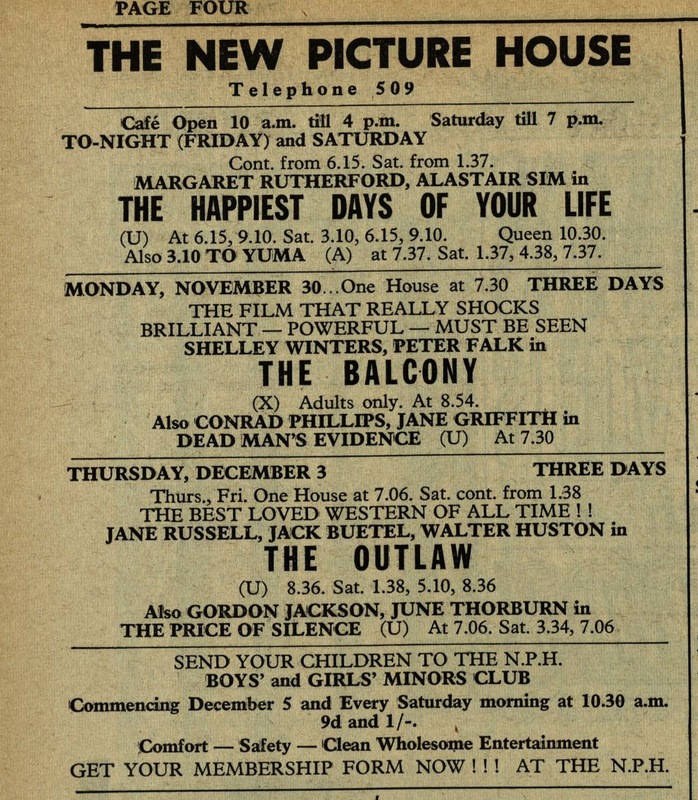 The CFF had a fairer distribution system that helped independent cinemas, such as The New Picture House, get first-run pictures. Indeed on 1 May 1965, The New Picture House held the Scottish premiere of the Children’s Film Foundation production, Eagle Rock. Henry Geddes, the newly appointed head of the CFF, directed the film. In keeping with many of these CFF films, Eagle Rock emphasised the importance of teamwork. According to The Citizen, the NPH was chosen on the strength of its local minors club. ‘Our club was formed here in December’, a report explained, ‘and already we have more than 600 members’ (The Citizen, 1 May 1965). The premiere attracted Forsyth Hardy, a prominent Scottish film critic and film historian, and provided occasion for committing the St. Andrews Minors Club itself to film. The club advertised that the children arriving to the premiere would be filmed from 10:00 to 10:30 on 1 May. On 5 June, a month after the event, the cinema invited all members and parents to see the result; a chance to see themselves up on the big screen. The choice of St. Andrews for the premiere may appear surprising given that the Minor’s Club was only a few months old. However, the St Andrews Minors Club was bucking a national trend that saw a marked reduction in the number of Children’s Cinema clubs during the decade. Furthermore, while other minors clubs had descended into raucous meeting places for children, the St. Andrews Minors Club publicly presented itself (however accurately) as a moral, education meeting place that harkened back to J. Arthur Rank’s original vision for these clubs. Field, Mary, Good Company: The Story of the Children’s Entertainment Film Movement in Great Britain, 1943-1950 (London: Longmans Green and Co., 1952). St. Andrews Citizen 5 Dec. 1964, 5. St. Andrews Citizen 1 May 1965, 5. St. Andrews Citizen 15 Oct 1966, 5. St. Andrews Citizen 17 Dec 1966, 5.